Could zombies be a viable replacement for slave labour? Asking for a certain electronics company. And most clothing manufacturers. 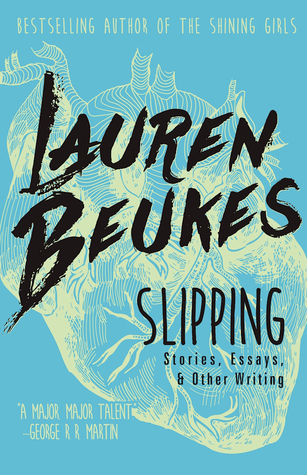 Slipping is an interesting collection of writing from the brain of Lauren Beukes. From enhanced athletes to bored ghosts, these stories display Lauren’s spec-fic interests. There are also a few essays at the end of the collection, one of which explains the personal inspiration behind The Shining Girls; an essay well worth reading. I met Lauren at a writers’ festival where she was running a workshop on, surprise surprise, writing. I really enjoyed reading the aforementioned The Shining Girls as it was a highly enjoyable mix of crime and spec-fic. So I was looking forward to reading this collection. As with any collection of previously published works, there are highs and lows. For me the highs outweighed the lows, with Slipping, The Green, and Ghost Girl being amongst my favourites. I think the strengths of this collection come from the South African cultural influence to Lauren’s writing, which gives far more grittiness to the bleak sci-fi stories than you usually see. If you’re a spec-fic fan, or a fan of Lauren’s writing – and how could you not be? – then you will find some compelling stories in this collection.